When a bride-to-be is contemplating the kind of look that she wants to have on her wedding day, it’s not uncommon for her to opt for a hairstyle that requires quite a bit of hair length. Whether it’s hair that’s “homegrown” or she needs a bit of weave assistance, there are literally dozes of different things that she can do with long hair. But what if you’re the kind of bride who has short hair, loves it and has never desired to have a weave track come within 50 feet of your head? 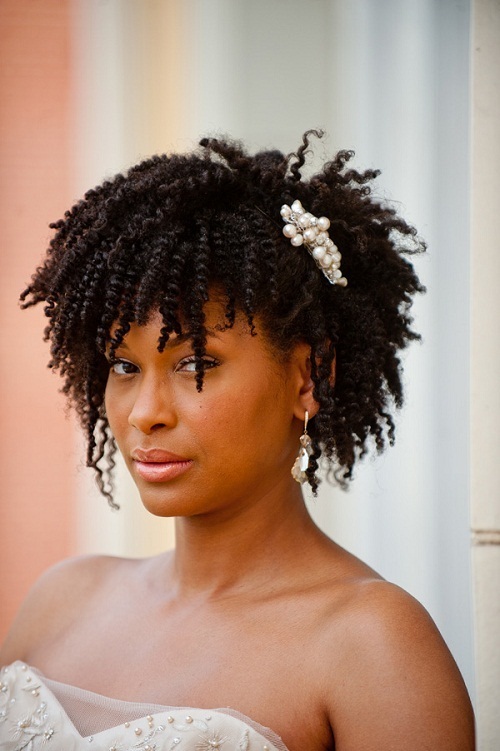 Are there still bridal hairstyles that are appropriate for you? Most definitely. These are just some of the looks to provide you with a bit of inspiration. Cuts that will make former brides wish that perhaps they had gone the shorter route and single women “bookmark” short hair as being a viable wedding day option for when their time comes. If you’ve been wearing a bob and you’ve always fantasized about wearing an updo on your wedding day, you can. It will take a few more hair pins and a bit more creativity, so you might need the help of a stylist, but this picture is just one example that it’s easier than you might think it is to pull off. 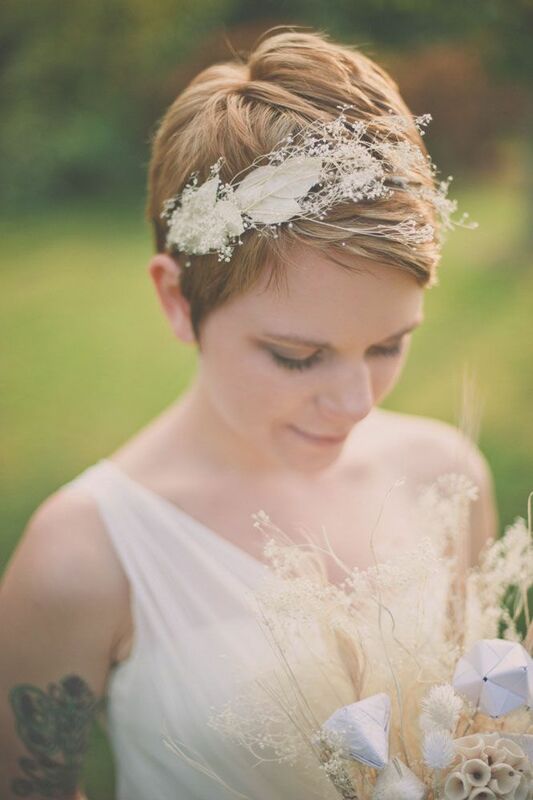 Pixie cut brides are always beautiful. Especially if they happen to have relatively long bangs in the front. 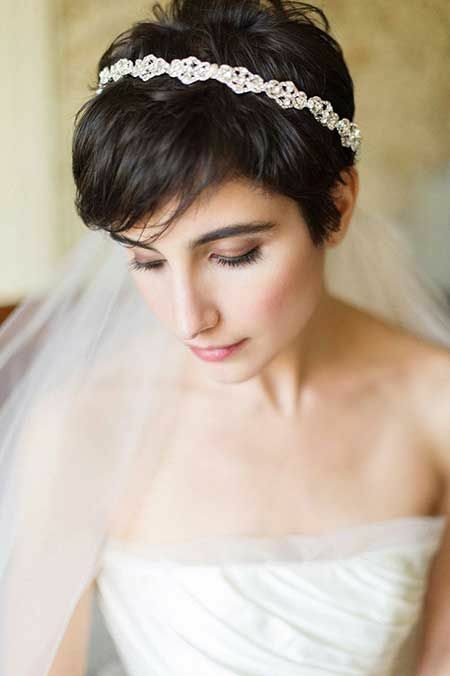 Speaking of pixies, whether or not you decide to hear a veil, you’re going to be drop dead gorgeous in an asymmetrical pixie cut like this one. One way to make your short cut still look ultra feminine is if you take your bangs and sweep them over to the side. Just make sure that they are smooth and sleek in order to provide more of a dramatic effect. If you currently have a bob with bangs (which is actually pretty popular right now), there’s no need to figure out another style. Just look for the kind of headpiece that will accentuate it well. The wet look is in right now too. 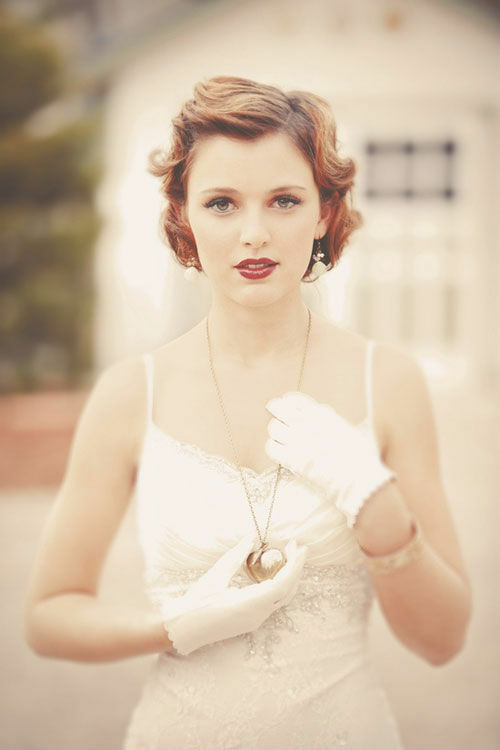 A bit of product to create some finger waves can give you a hairstyle that’s very similar to this one. If you plan on wearing a shorter gown, you will be adorable in a hairstyle that has more spikes than curls. Is your hair naturally curly? If so, don’t hide it. Cut a few layers into your bob and be loose and fancy free. 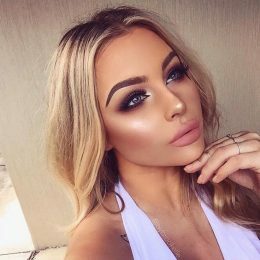 Rose gold is one of the most popular color trends from head-to-toe right now. If you happen to have a short hairstyle with a lot of volume, brush it back for a bit of flair and sophistication. 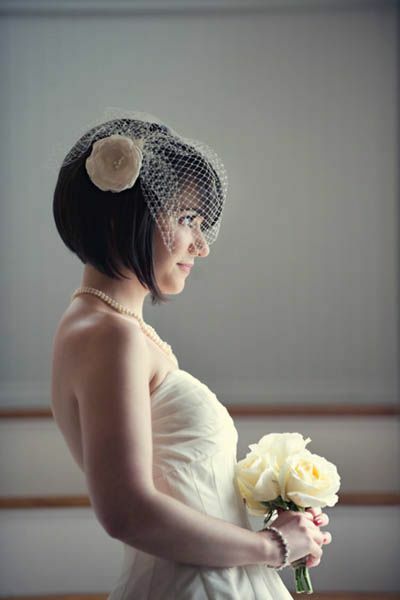 There are some haircuts that are so simple yet awesome that a bridal hairpiece is not required. This is one of them. She look straight out of a period movie, doesn’t she? A bang with short waves added to it is beyond wedding day romantic. If you want to mix retro with modern, how about a cut like this one. It is a throwback from The Supremes and pardon us for saying it but she looks oh so supreme with it. If you have a short style that you’re currently in the process of growing out and you hate the thought of cutting it, get it trimmed instead. Some transitional looks are just as beautiful. It takes a bold and confident woman to wear a fade on her wedding day. But being that getting married is a bold and confident move, we think that the look fits the act. Quite well, in fact. Bobs are so sweet. And asymmetrical ones add a touch of spark and personality to any bridal attire. Here’s another way to style a short bob. If you don’t have enough length to pull it all back, you can pin the back portion and leave the sides and front out. 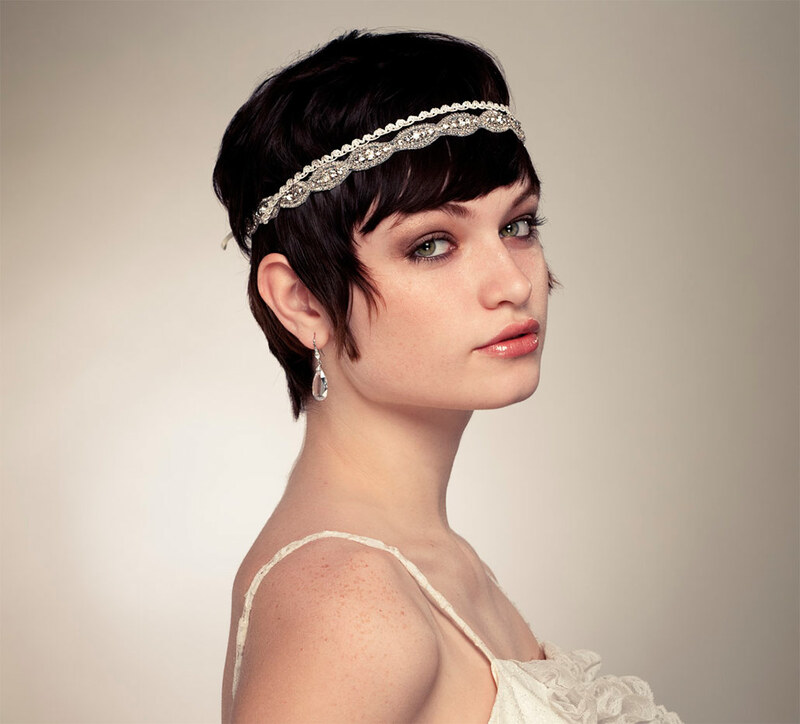 If you have a pixie cut and would prefer to go without a veil, get your bangs cut. You’ll be such a cute bride. And as a bonus, your hair will require a lot less maintenance while you’re on your honeymoon. Sometimes, it’s the little details, even in a haircut, that can make all of the difference in the world. For instance, this is basically a pixie cut with long sideburns. But see how distinctive the cut is with them? If you’re a black woman with natural hair, don’t straight it for the occasion. Get your locks twisted into small coils. It will frame your face so wonderfully. Speaking of natural hair, if yours happens to be naturally curly and you want to wear it short, you will not go wrong with a cut like this one. Chic is only one word that can be used to describe how special it will make you look on your wedding day!